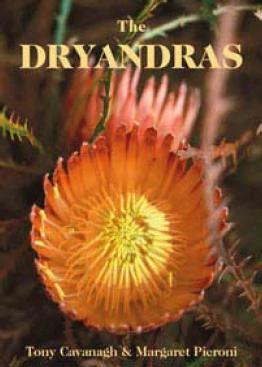 The long awaited publication, 'The Dryandras' has finally arrived and the wait has been well worth while. To produce any work of quality takes dedication and painstaking research and that is just what is in abundant evidence in this book on a fascinating genus of endemics from the west. We have seen in recent times excellent publications on different genera of Australian flora ('Brachyscomes', 'Verticordia', 'Grevillea' etc.) that are definitive, are both botanical and horticultural, useful as reference books or applicable in the field. They can be referred to by the enthusiast or botanist as they have keys; useful in the nursery or garden, with excellent illustrations and horticultural notes. The knowledge of Australian flora has come a long way in the last 40 years, and picture books displaying the beauty and diversity of the flora have played an important role and still have a place in the education of viewers about the richness of plant life on this driest vegetated continent. Today 'plant people' want more. They want to know about all aspects of a genus and the range of species within that genus. 'The Dryandras' will certainly fill that requirement and it will go a long way to informing us about the species we meet as we scratch around the south west of Western Australia. It will also give the planter of these treasures something to search for in nurseries, and we know what happens when a demand is created - the range of species is increased and in some cases important conservation work is achieved. However, beware! 'The Collector' will stop at nothing to obtain! Focussing on the book - from the front dust cover to the 'mug shots' on the inside flap, the photography is excellent. There are several photos of the plants - from a close-up of the flower to the habit of the species, and all large enough to see, an all too often restriction when costs are mounting. The illustrations of the leaf, seedling, follicle and seed for each species assist in diagnosing the specimen and it places this book amongst others on the top shelf of specialist books on Australian flora. The text is thorough - defining the name, where first collected, a botanical description, distinguishing features, similar species, distribution, conservation status, habitat, flowering period, cultivation notes, and a location map accompanies each species. So how has this wealth of information been amassed? Both of the authors have spent decades involved in their study of the genus in the field, nursery and garden. Both have been leaders for considerable periods of the Dryandra Study Group since Tony initiated it in 1974 and they have extensive field experience, observing, collecting and photographing. Margaret is well known as an outstanding botanical artist and her achievements include the paintings of all of the Verticordia published in a book of that name. Tony has revelled in researching the collecting and naming of Australian flora since first specimens were taken and we have been fascinated by his articles, papers and addresses over the years so the reader will not be disappointed in this aspect of 'The Dryandras'. The biology and ecology of the genus is explained and there is a very useful calendar of the flowering times of species as well as notes on the various bio-regions of southwest Western Australia. A most useful table depicting the horticultural aspects of each species of the genus will aid in selection and enable the grower to at least provide as good conditions as possible for their growing. A selection of species is recommended from three different height groupings with coding to inform the grower of particular requirements or expectations of the plants chosen. As you would expect, there is a thorough treatment of the propagation and maintenance of the genus from the collection of seed to the demise of a species. The botanical organisation of Dryandra has it classified into three sub-genera and 135 species. Each of these is explained and accompanied by line drawings of the flower and individual florets so that the subdivisions can be clearly seen and understood. The botanical key follows as a logical conclusion to the identification process. I find the glossary of botanical terms included here annoying as it is hidden and difficult to locate when stumped by botanical jargon. It would be easier to locate at the start or end of a book. The alphabetical treatment of each species enables speedy reference. Treatment of the detail aligns with that experienced in similar publications, making this book an invaluable addition to the library, and for those with a serious interest in Australia's unique flora this is another 'must have'. It's not exactly a glovebox book unless you travel by truck but it certainly needs a prominent place in your library box when visiting the west and would be invaluable in identifying digital images on returning home. Congratulations to the authors who are located on opposite sides of the continent, on a magnificent collaborative effort to produce such a work of quality. Australian Plants Society (SGAP Victoria) Inc and Wildflower Society of Western Australia Inc, 2006. From Growing Australian, the newsletter of the Victorian Region of the Australian Plants Society, December 2006.